25 years ago in Transfomrers PART 4: IN SPANISH IT MEANS KRONDAY! Back in 1993 I was vacationing in Denver when I went into a comic book shop and under the counter glass they had what looked like a red Transformers Sunstreaker and a black Ironhide. I had no idea what they were and the comic shop guy said they were "the rare Japanese versions". Just as goats have an innate fear and distrust of chupacabras, I fear and distrust information from comic shop employees. This was way before I had internet and pre Thoroughly Informative Transformers Themed Internet Entertainment Sites so I had no way of fact checking comic shop man's assertion. But I got the feeling he wasn't very credible because in the same display there was a Hubcap he was trying to pawn off as Bumblejumper. This "Hubblejumper" misidentification is usually indicative of either a) comic shop assholery (if they're trying to rip off people who don't know better) or b) comic shop dumbassery (as in, they are dumbasses). The latter is usually the case. Japanese or not, twenty bucks each seemed a bit steep for the wrong colored and possibly knockoff Sunstreaker and Ironhide, but I bought them anyways. I noticed the red countach had a sticker that said "Diakron" on it and years later the internet helped me figure out just what these things were. It turned out Diakron was an attempt by Takara (the japanese creators of many toys that would eventually be sold as Transformers) to market their own line of transforming toy robots in America back in 1983. This was before Hasbro partnered up with them to create the Transformers. The Diakron line was originally made up of a robot called Multiforce 14, three pull back and go Powerdashers, and three transforming robot cars named DK-1, DK-2 and DK-3. Those last three were toys that would eventually go on to become known as Sunstreaker, Ironhide and Trailbreaker once Hasbro picked them for Transformers, except they started out in different colors from their Transformer release. Diakron is also the tenth circle of toy robot hell-after you know about it, forever does that knowledge mark you a nerd. vice president of Griffin-Bacal during the launch of the Transformers, where Mr. Kurnit states that one problem the line had was that Diakron's name "had no meaning to anyone". I take personal offense at that. Obviously in Spanish it means "Kron Day". Mr. kurnit also goes on to say Diakron's "launch was a colossal failure because in no way, other than the fact that they were ingenious toys, did it connect to anything meaningful in kids' lives". Kurnit isn't the only former exec harsh on the 'Kron. George Dunsay, Hasbro's vice president of research and development in 84, states the line didn't do well because of a lack of marketing. So here we have a pattern of executives involved in the creation of the Transfomers repeatedly stressing the "failure" of Takara to market their robot toys successfully in the US. 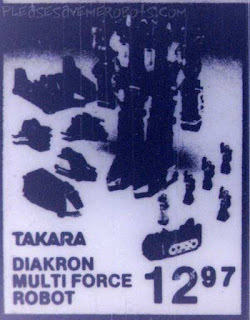 But I've seen ads that show Takara continued selling the Multiforce 14 well into 1985. While it's true that the Diakron name 'died' after 1984, all Takara did was change it to Kronoform and continue to sell their Multiforce 14 and other robots that were not picked up as Transformers. I also recognize Japanese marketing brilliance in "Kronoform" being a way for Takara to keep their "Kron" while capitalizing off the Trans"Form"ers name. Despite being a marketing failure to some, DiaKron(oform) remained profitable enough that it lasted at least three years. 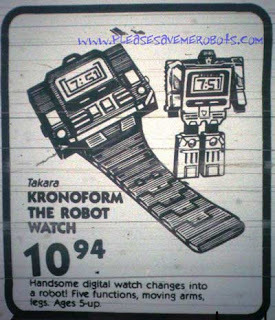 There is no denying that some of Takara's toys would not have reached the level of popularity they enjoyed had they not been reborn as Transformers, but there is also no denying the rage that swept a nation, KRONOFORM ROBOT WATCH! I personally don't remember Diakron on the toystore shelves but it was '83 and at nine years old I was all obsessed with He-Man. I used to beat myself up for not being more sentient as a child because it cost me a chance to be on the Diakron bandwagon from the beginning (and also forty bucks at that comic book store 10 years later). But then that interview with George Dunsay came along and he stated that Diakron was a Toys R Us exclusive line. Since I had a couple of friends older than me who remembered TRU being the only place they saw Diakron back in the day, I accepted that and I stopped hating on my He-Man obsessed 9 year old self. My hometown of El Paso, Texas didn't get a Toys R Us until 1987. I was at peace with myself in the same way that I can accept not being the guy who invented Star Wars because 30-years-older-than-me George Lucas beat me to it. But then little holes began springing up in that TRU exclusive theory. First off, why have I never seen a Diakron toy with a TRU price tag? Speaking of price tag, there's a picture of a Diakron countach at Super Toy Archive where the badly mangled price tag seems to be that of KB Toys. I rationalized that by theorizing KB oftentimes acted as toy liquidators and maybe they bought up TRU's remaining Diakron stock for clearancing at their stores. I could still live with myself if that were the case because El Paso just barely got a KB in '83 and they were all about new toys, not clearance stuff. So I still never had a chance, right? But there were always lingering doubts in my mind. How could Denver, a place that never had a Toys R Us until 1990, have Diakrons in comic shops? Toy robots archaeology was much simpler before eBay because where you found toy robots was usually the same geographic area where they were sold at retail. Finding a toy robot on the secondary market at a swap meet or garage sale or comic shop was strong evidence that the toy robot originated at a toystore in that area. I found the usual exception to this back in the 90s was comic shops near military bases because military people tend to come from everywhere and sell their stuff to the nearest collectibles dealer. But the bases in Colorado were all in or near Colorado Springs, 80 miles south of Denver. How could I have found roboarchaeological evidence of Diakrons in Denver in 1993 if they were Toys R Us exclusives ten years prior? Then a bomb dropped on me during Vintage Space Toast Tour Denver this month when I was looking for Zoids ads in 1983 newspapers. Again, Denver didn't have a Toys R Us until 1990 so finding a Diakron Robot Cars ad was the last thing I ever thought would happen. But lo and behold, in the Novemeber 30th, 1983 edition of the Rocky Mountain News was a flyer from Circus World advertising Diakron Robot Cars of the Future. I was both excited and pissed off. 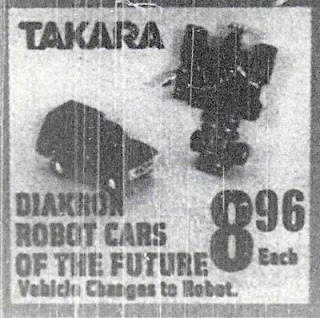 Excited because a Diakron Robot Cars ad is one of my Vintage Space Toaster Palace holy grails, and pissed off because this proved Diakron was not Toys R Us exclusive, KB probably did have them new in El Paso in '83, and I was a nine year old dumbass. 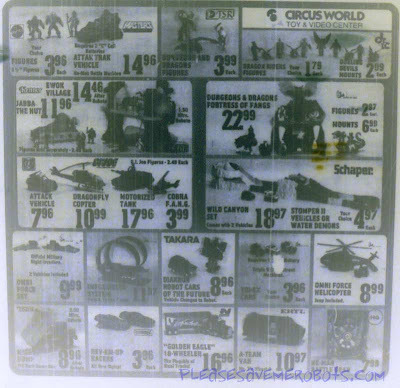 Circus World was a very different, very separate retail chain from Toys R Us. In the wake of this ad and the KB price tag at Super Toy Archive I can only conclude Dunsay misremembered, but I'm left wondering why he'd say Diakron was exclusive to TRU. There's got to be a nugget of truth in there somewhere. Did he really mean Diakron was exclusive to the less prominent Circus World, but he forgot the specific chain? I've never found a TRU ad for Diakron but that means little. And I certainly don't feel betrayed by George Dunsay or anything. This isn't Ben Kenobi telling me Darth Vader killed my father (and then it turns out Darth Vader is my father). It's more like Ben Kenobi telling me Darth Vader had an extensive Diakron collection, all of which he bought at Toys R Us. I was pretty happy to find the robot cars ad on this, the 25th anniversary of the Diakron line. I think I will celebrate November 30th as Kron Day in rememberance. Now that I've found a Circus World Diakron Robot Cars ad, the next step is to find one from Toys R Us and maybe even Kay Bee. Then after that, build a time machine and go back to 1983, wait in KayBee Toys in El Paso and smack my 9 year old He-Man loving self in the back of the head when I see him in the action figure aisle. if you take one of those new Sunstreakers and new SIdeswipes from Universe 2.0 and switch the heads you can have a Diakron 25th anniversary red lambo robot. You can call it DK-2008. I would name it King Kron. I thought about doing the headswap but the ones at Wal-Mart don't have the chrome spoilers like in the picture. I guess those are the Japanese ones? I really like the chrome spoiler but I don't think I $25 each like it. While I suspect that some of Kronoform's endurance owed to the success and popularity of Transformers and to some extent Gobots, I find it amusing that the Hasbro execs talk down the line so much. Really, when you think about it, they stuck on a name and redesigned a package and are treated as heroes. It was Takara that created the damn toys in the first place. And we all have our nine-year old dumbass moments. Mine was not begging for the cardboard cut-out Sears exclusive Cobra Command centre. Sigh. After all the newspaper articles I've read about wholesale orders of the line leading up to its May launch in '84, I've come to the conclusion that the media tie ins didn't play any role in the sales success of the line that first year. It was going to be big anyway based on how much the retailers had ordered in February but Stephen Hassenfeld's overly conservative outlook in regards to projected sales ensured that sales capped off well below what they could have potentially been. Any popularity due to the media tie ins was added only after the toys were already a sellout at the wholesale ordering level. The toon certainly contributed to the popularity during '85, but on the flip side, it helped kill the line after '85. I really think cartoons back then were double edged swords that didn't help so much as harm if they were bad. GoBots and Voltron are good examples of the animation sabotaging the toyline's success. If I do another '25 years ago' post I'll expand on these thoughts and back them up with numbers and references. I swear that when I was a kid I used to see Diakrons at flea markets and laugh them off as knock-off crap. Wished I'd have spent my allowance on them now.